Now, one of its biggest rivals in the market, Nokia, claims to have done just that. 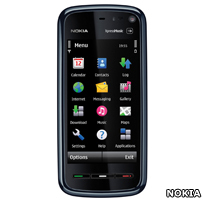 Released on 23 January, its 5800 XpressMusic is the company's first touch screen phone. Costing almost £100 less than the iPhone, it could start a price war. But at £250 it's still not cheap and the big question is - is it good enough to take on Apple? Newsbeat listeners Sophie Reed and Nik Williams got a sneak preview and gave us their thoughts. Sophie's first impression wasn't good but it did improve. She said: "When I got the phone I thought it was quite hard to use - the screen is smaller than the iPhone - but I've had it a couple of weeks now and I've gotten used to it. "You can view pictures, go on the internet and connect to any wi-fi that's available." The 5800 has got 8G of memory, meaning it can hold around 6000 songs. And Sophie reckons that's one of its best features. "I think it's really good as a music player. I just got loads of songs from my computer, put them all on there and the quality when you play it out, either through headphones or its speakers, is really good," she said. Style wise the 5800 is slightly thicker than its rival and has a smaller screen - 3.2 inches compared to 3.5 for the iPhone. She said: "It's a bit chunky but because it's got a big screen it looks quite good. But I think the iPhone looks cooler really because it's thinner and looks more modern." Although it uses similar touch technology to the iPhone, the 5800 comes with a plastic pointer pen that makes it easier to use than just with fingers. But Nik reckons the pen takes away from the whole point of having a touch-sensitive screen. He said: "It just seemed so fiddly to use with your fingers. "You either missed what you were trying to hit or ended up touching the wrong part of the screen or internet link and ending up not getting to where you wanted to be." 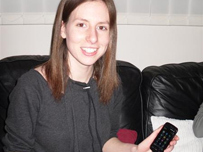 Sophie said: "It's a good phone, and cheaper than the iPhone. But I don't think it's as good because the iPhone has a bigger screen and seems to have more to it." Nik said: "It's got some pretty cool features but ultimately, for me, Apple has just set the bar so high with the iPhone that the 800 XpressMusic doesn't come close."